“Unfortunately due to weather, the asphalt would not adhere properly to the pavement and the speed tables on Bridgeland Drive could not be installed. 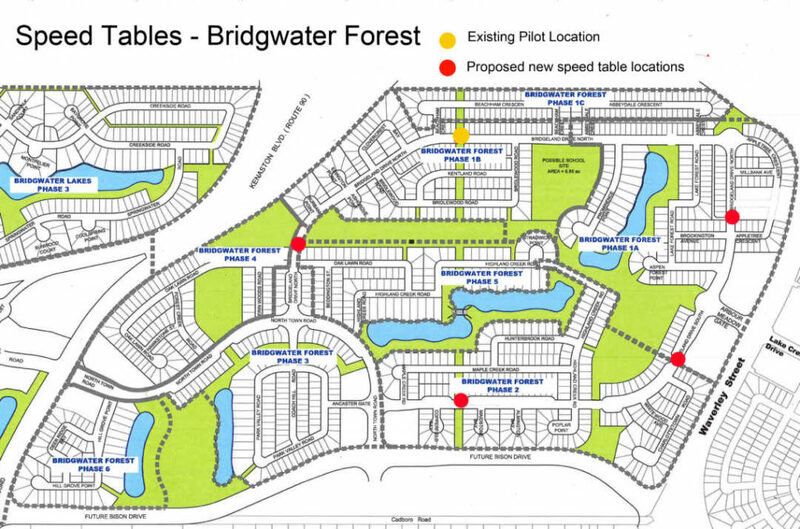 Bridgeland Drive was one of eight locations across the City that Transportation requested either traffic calming or intersection improvements be installed this year. Central Services was able to complete six of these projects before the weather changed. 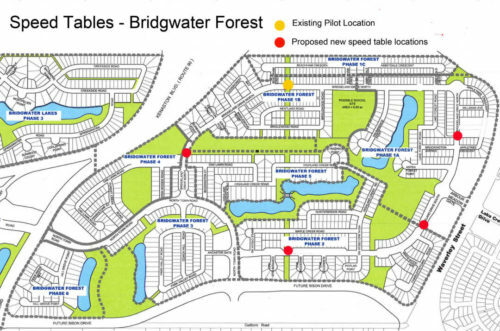 Two projects, including speed tables on Bridgeland Drive, are being deferred to 2019. In 2016 I initiated multiple ‘Speed Table Pilot Projects’ on various collector streets (streets that collect residential traffic, and are streets for transit buses and emergency vehicles) in the South Winnipeg St Norbert ward as a method of calming traffic. From years of working on active transportation projects, I have come to learn that the most effective way to calm traffic is by changing the ‘build environment’. In 2016 the Public Works department installed a speed table on Bridgeland Drive North – between both ends of Beacham Crescent. The speed table were located to calm traffic on open stretches and also located so they would provide a link to the pathway network, allowing a raised area for pedestrians to cross. All of the ‘Speed Table Pilot Projects’ speed table projects have proved to be very effective in calming traffic over the past three years, so due to ongoing requests from residents, I am now installing more. The Public Works department has approved installation of four ADDITIONAL speed tables on the collector streets of Bridgeland Drive North and South. See the image of proposed locations, which also are located as links in the pathway network. The Public Works department has indicated to me these tables will be installed this construction season (2018).